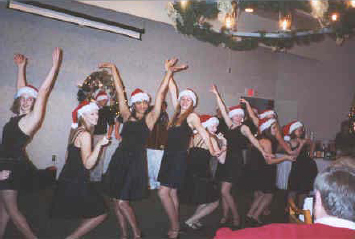 The Christmas party of the Jasper Deutscher Verein was held on Thursday, December 19, 2002 at the Jasper Country Club. Over 95 members, children and guests attended the Christmas party. President Darren Patterson welcomed all in attendance. 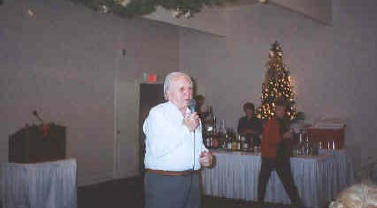 Lowell Glendening led the group in prayer prior to the hors d’oeuvre buffet. President Patterson then presided over a short business meeting. He recapped events that took place during his years as Vice President and President of the Deutscher Verein. His term as president will end in January 2003 and Dan Gutgsell will succeed him. Darren thanked all members, board members and officers for the support given him. He thanked Eb and Ruth Reichmann for the support given to him through the years and Kathy Gutgsell for the excellent newsletter that she prepares for the Deutscher Verein. 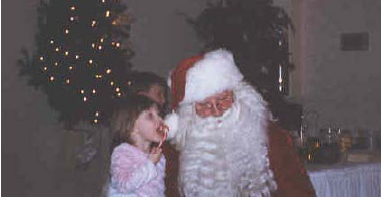 Santa Claus made an appearance and handed out gifts to the children and grandchildren of club members. Members of Jasper High School Show Choir and Performing Arts Club entertained the group with a selection of holiday favorites and encouraged club members to sing along. They also had skits and readings appropriate for the season. Membership is $10.00. Dues may be sent to Jasper Deutscher Verein, Attn: Rita Egler, P. O. Box 15, Jasper, IN 47547-0015. The half pot prize winner was Lester Huebner. Attendance prizes of poinsettias were won by Irene Kapp, Payton Prechtel, Bob Verkamp, Duke Herbig, Betty Schmitt, Richard Schmitt, John Weidenbenner, Brenda Buehler, Darren Patterson, Jim Sonderman, Marilyn Sonderman, Bonnie Sergesketter, Phyllis Ackerman, Dawn Cibrian and Kathy Gutgsell. Ruth and Eb Reichmann provided copies of German Life and they were won by Dave Prechtel, Lowell Glendening, Rachel Vonderheide and Fred Hollinden. Eb and Ruth Reichmann had just returned from a trip to Germany and they had visited with individuals in Pfaffenweiler and extended greetings from Pfaffenweiler to members of the Deutscher Verein. Eb Reichmann also lead the group in singing Stille Nacht. The January meeting will be the annual Wine and Beer judging and tasting to be held on Thursday, January 16th. More information will be available in the club newsletter. The club will provide beer and soft drinks. Members are asked to bring an appetizer / snack to share. Members will be allowed one entry in each category and certificates will be awarded for 1st, 2nd and 3rd place in the grape wine category and 1st and 2nd place in the nongrape / other wine and beer categories. Feb. 12, 7:15: "German-American Relations: Policies and Issues". John Clark, Senior Fellow at the Hudson Institute will be the speaker. President Gary Egler called the meeting to order. The minutes were read and approved. A thank you was received from Mary Jo Meuser for the gift of $200.00 from the Deutscherverein toward the support of the student studying in Germany this summer. Ron Kieffner announced that June 18th is the date the German Folk dancers and Jay the Blond Fox will be at the VFW. Tickets will be on sale for $5.00 each and will include a Bratwurst and drink. The committee will be the Board of Directors and club officers. Ron also stated that there will be German music on both stages each evening of the Strassenfest. Claude Eckert commented on the beautiful Easter services at Christ Redeemer Lutheran Church that were conducted in German. Gary displayed a pin that can be ordered with the Deutscherverein Club Emblem, which could be worn as a hat pin or on the ladies dirndl. Sharing her hobby with us, Natalie Baker gave some very informative information on how to trace your family. Eager to answer any questions that we had, she pointed out that “Genealogy” is now the Number 1 hobby in the United States. In appreciation for a job well done, the Deutscherverein presented the Wehr Coast of Arms to Danny and Linda. Danka Danka to the Wehrs. 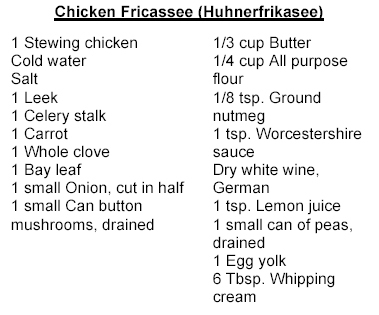 Cut chicken into pieces. Place chicken in a deep saucepan; cover with cold water. Add salt, leek, celery,carrot, whole clove, bay leaf and onion. Bring to boil; reduce heat. Simmer 1 to 2 hours, depending on size and tenderness of chicken. When joints linking thigh portions to main body move easily and seem flexible, chicken will be done. Remove chicken from cooking liquid; cool slightly. Remove skin and fat; cut flesh from bones in large pieces. Strain liquid. Cut mushrooms into thin slices. Sauté in a small amount of butter in a medium skillet. Melt butter in a large skillet. Stir in flour. Cook, stirring constantly, until light golden brown, about 3 minutes. Add a small amount of hot cooking liquid and season with salt, nutmeg, Worcestershire sauce, wine and lemon juice. Place chicken pieces, sautéed mushrooms and peas in sauce; warm gently over low heat. When all ingredients are hot, turn off heat. Let stand 3 to 4 minutes. Before serving, blend egg yolk and whipping cream in a small bowl. Stir egg yolk mixture into sauce to make it smooth and rich. Serve hot with rice. It’s that time of year again! Please submit your dues as soon as possible by completing and sending in the following form. Thanks!